While the car recycling fee that Moscow introduced on September 1, 2012 remain one of the major topics of the Russia-EU negotiations, Russia ignores European Commission’s request to revise its rates. The car recycling fee that Russia introduced on September 1, 2012 was one of the topics of the Russia-EU negotiations in Moscow on March 21–22, according to sources familiar with the talks. During Russia-EU negotiations on March 21-22, sources say the European Commission did not object to the Russian government’s model for leveling the playing field for automobile importers and manufacturers. Sources also told Vedomosti that Russian officials announced at the talks that the size of the recycling fee would not be reduced. The European side did not object to this either, even though they had asked for a rate reduction. 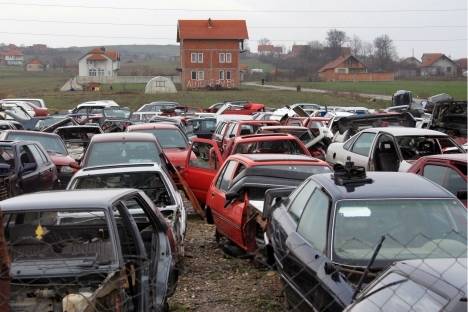 It is expected that the Russian mechanism for auto-scrapping guarantees will be discontinued by mid-2013, and all manufacturers will be required to pay a recycling fee. The base rate is 20,000 rubles ($650) for passenger cars and 150,000 rubles ($5,000) for buses and trucks. The fee is currently levied on auto importers and certain automobile manufacturing plants that were not able to assume recycling obligations (mainly small manufacturers of specially equipped vehicles). The European Commission has demanded a level playing field after Russia’s accession to the WTO, arguing that the differences in approaches discriminated against importers. The European delegation did not object to the Russian government’s idea of introducing compensation for automobile manufacturers operating under the industrial assembly regime (which enjoy exemptions on imports of components), because the terms and conditions of earlier investment contracts would deteriorate after the transition to a universally collected recycling fee. The European Commission was reminded that most agreements of this kind had been signed with European auto companies. Had the government reduced the recycling fee, imports would have increased and international auto companies would have had fewer incentives to establish new production facilities in Russia, as well as develop existing facilities. An increase in car prices will be one consequence of the decision. “The market will certainly respond with a price hike. This is unavoidable, even though each manufacturer’s situation is unique,” Yo-Avto CEO Andrei Biryukov said.